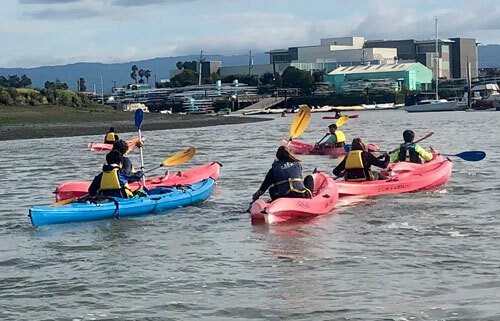 BIAC offers the following "learn to" programs offering opportunities to learn a variety of water sports and enjoy the waters around Bair Island and the Port of Redwood City. In sweep rowing, each rower uses one oar. 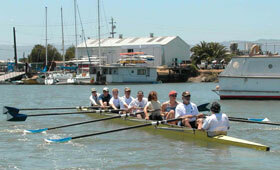 Sweep rowers typically row in boats with 4 or 8 rowers and often have a coxswain steering the boat. Sweep is ideal for someone who wants the camaraderie of a team sport and aims to go fast in big boats! We're offering 6 sessions from May-August. Click here to learn more and register! In sculling, each rower has two oars, which allows them to row in a boat by themselves (a single) or in a boat with 2 or 4 people. Sculling is ideal for people who want to learn rowing technique and then be able to train on their own schedule. We're offering 5 sessions May-July. Click here to learn more and register! See why stand up paddle boards are all the rage! They are an easy and fun way to exercise. This class is geared to those who have never tried a SUP or want tips on how to be successful. We teach proper form, maneuvering and how to navigate the inner harbor/Bair Island. 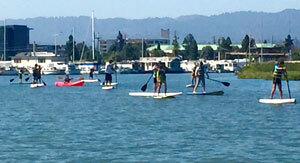 Learn how to cruise the bay on our sit-on-top kayaks. They are an easy and fun way to exercise. This class is geared to those who have never tried a kayak or want tips on how to be successful. We teach proper form, maneuvering and how to navigate the inner harbor/Bair Island. Outrigger Canoe (Wa’a) Paddling is an ancient form of ocean travel that offers a fantastic, low-impact, total-body workout. 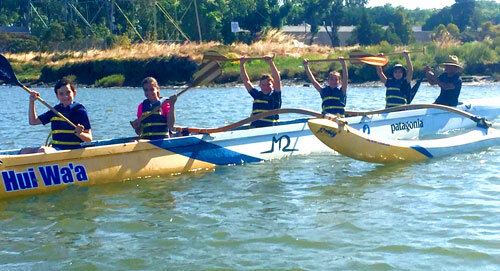 Learn basic paddling technique and experience the satisfaction of working with your crew mates as six paddles become one. Our indoor programs offer a unique experience for rowers and non-rowers alike to build fitness, improve technique, and become a part of the BIAC community both on and off the water. 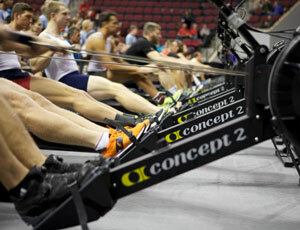 Classes will include workouts on an indoor rower (ergometer).